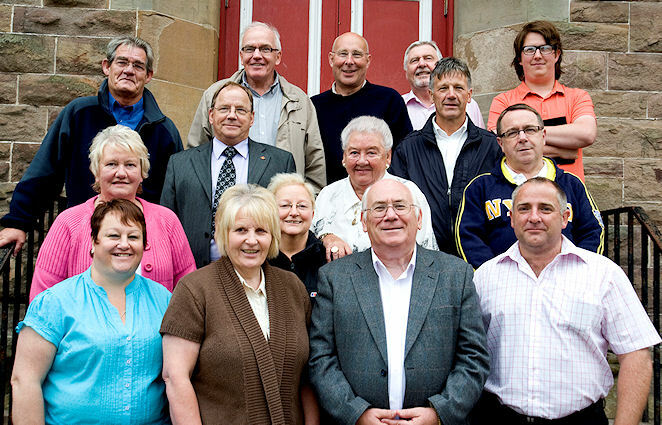 Maybole Community Council 2010-13. Left to right Front row - Gillian Durrant, treasurer; Anne Walker, secretary; David Kiltie, chairman; Mark Fletcher, vice chairman Second front row - Marianne McCreadie, Helen Whitefield, Pearl Barton, Jim Paterson Third front row – Alex Kelly, Roy Birnie Back row – Peter Mason. William Grant, Peter Lynn, Alan Murray, Gavin Hamilton Missing - Senga Mason who was unable to be at the meeting.